Risby is a pretty village not far from the A14 and the sprawl of Bury St Edmunds, but to stand on the village green you would not know that either were there. 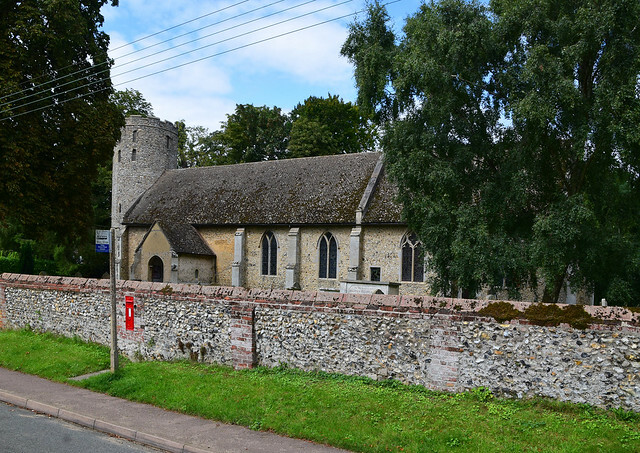 The church is set along the road to Bury in a tight sleeve of a churchyard. 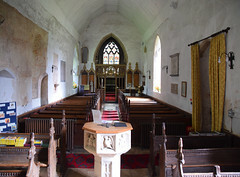 It is a long church, the nave and chancel mostly of the late 13th and early 14th Century, so at the very height of the English Decorated period. By way of contrast, the tower is a rugged Norman affair, the solid arcading at the top quite different from that of elegant Little Saxham a couple of miles across the A14. Back at the start of the 21st Century, St Giles was one of the very last Suffolk churches I ticked off on my first journey around the county, and I had not been back since. 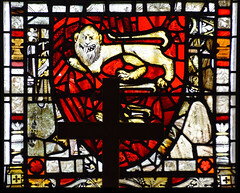 Since I have revisited just about every Suffolk church in that time, it means that I have been away from Risby church for longer than just about any other in the county. Back in 2003 it had been the very first church I ever photographed with a digital camera, a strange thought now. You step into a church which is full of interest, although it seems to be little-known. 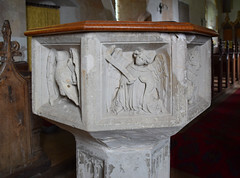 Risby church has a little of everything. Fortunately, this does not seem to have been a wealthy or populous place in the 19th Century, so the Victorians saw no need to add aisles. 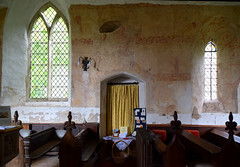 Because of their restraint, Risby church has a surviving expanse of wall paintings along the north side of the narrow nave. 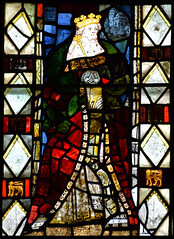 A couple of features stand out, including Mary Magdalene kneeling to anoint the feet of Christ, and a sombre cleric who is probably St Thomas of Canterbury. An axe head pokes from what might have been a martyrdom scene. 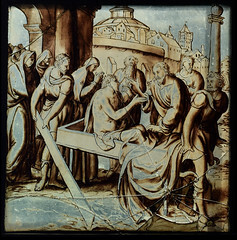 A sequence of the life of Christ has faded within living memory. 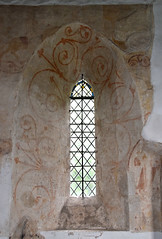 On the south side of the nave, one window contains four panels of continental glass. 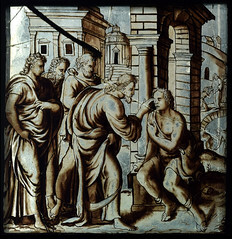 The two lower pieces depict Christ healing a lame man and a blind man. 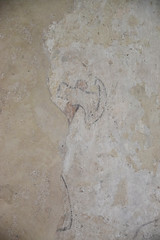 The roundels above, although faded, are more interesting. 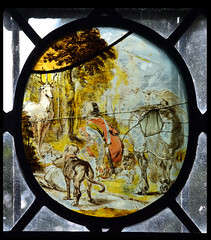 One shows St Hubert's vision of the crucifixion between the antlers of the stag he is hunting, and the other appears to show St Paul debating with Festus before Herod Agrippa. 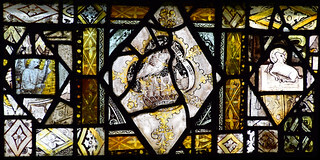 The medieval glass at Risby survived into the 17th Century, because we have the fascinating detail of a receipt given in May 1644 by the iconoclast John Crow to the Risby churchwardens for the forty shillings fine they had paid for not destroying it as required by the parliamentary ordinance. 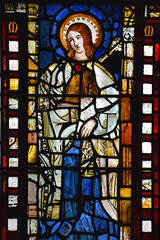 It seems to have been smashed soon after, but in the 19th Century the wife of the rector, Samuel Alderson, recovered fragments from the churchyard, and these were used in 1850 to create composite figures in the east and south chancel windows. 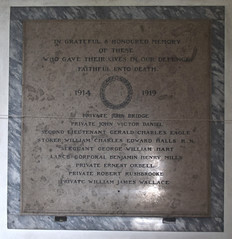 The plaque beside them refers to their restoration in the 1920s. It's not the kind of thing we would do nowadays, but it is very effective. 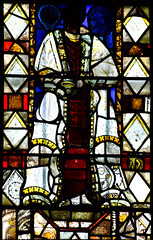 The male figure in the south window has an arrow, so was probably intended as St Edmund, although he is flanked by two As and has part of a banner of St Andrew. 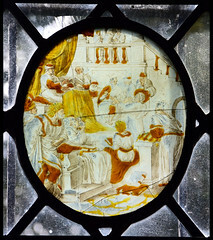 The female figure is flanked by two Ms, typical of a Blessed Virgin scene, but she has part of a wheel and was probably intended to look like St Catherine. Both figures have 20th Century heads. 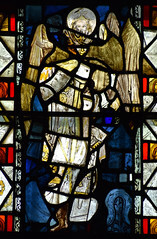 In the east window, one figure is made to look like a king and the other a bishop with a 14th Century head. 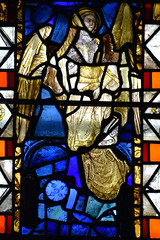 The figure of St John is almost wholly 19th Century apart from the hands, but the angels either side are made up of 15th Century fragments. 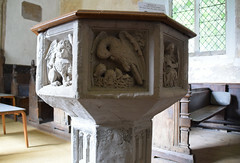 Perhaps best of all is the Pelican in her Piety towards the bottom, reflecting back the one on the font. 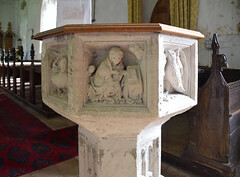 She is flanked by a censing angel and an agnus dei. 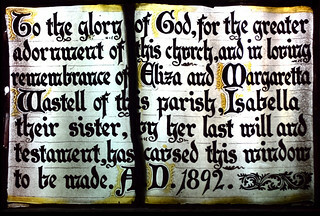 As with many fonts in the middle of the 16th Century, Risby's was plastered over to hide idolatrous imagery. When the plaster was removed in the 1890s, a beautiful Annunciation scene was revealed, as well as a striking Pelican in her Piety. 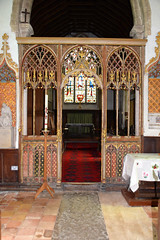 East of the font is an exquisitely lovely rood screen, tall and narrow, with just three lights each side of the entrance. 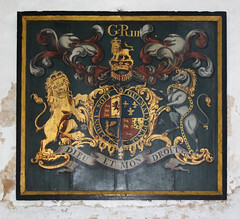 It is flanked by image niches backed with gold gessowork. 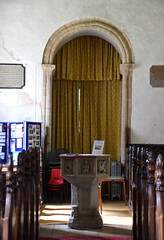 The tower arch is lower than Little Saxham's, but as there another opening sits above it, and was probably the original entrance to the tower, with a ladder which could be drawn up. The view westwards is memorable, the creamy light from the mostly clear windows falling softly over fifteenth century benches, one with a fragment of a 15th Century lady kneeling on its bench end, perhaps a survival of another annunciation scene. The Victorian bench ends further east are tall and proud, carved in rich profusions of fruit, flowers and foliage, each one different. Mortlock tells us that they were the work of the rector, Samuel Alderson, and it was his successor, Thomas Abraham who oversaw the thankfully restrained restoration in the 1880s. 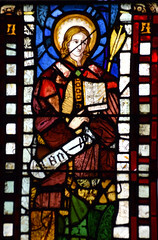 Having paid for this, Abraham not unreasonably had the chancel glass dedicated to earlier members of his family. The best is probably by Clayton & Bell, depicting Miriam and St Cecilia and dedicated to Ellen Abraham who died at Florence in 1880. 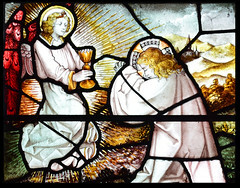 The Baptism of Christ is a typical work of Kempe & Co. 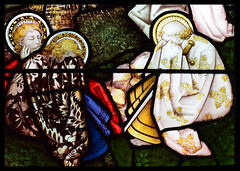 The third, a curious and interesting little panel set in the low side window and depicting the agony in the Garden of Gethsemane, seems older, but is possibly by Kempe & Co as well. 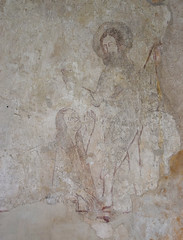 The firm came back in the 1890s to produce another typical piece depicting St Peter and St Paul for the Wastell family in the nave.